This release provides an updated geolocation search. What a helpful and wonderful app. 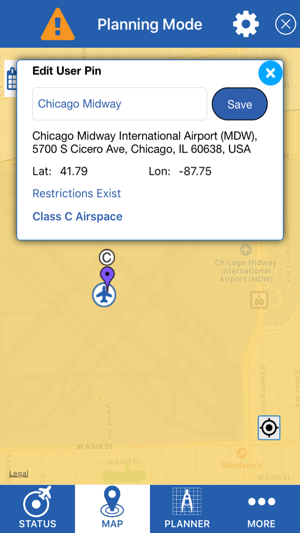 If you are a novice aviator or just have some interest in airspace restrictions- this is a great app. 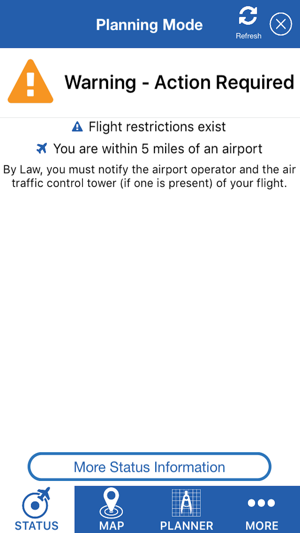 You are clearly shown known manned airports, restricted airspace, and given lists of locations and dates as well as details of what restrictions are specifically in place (such as max/min altitude etc.) 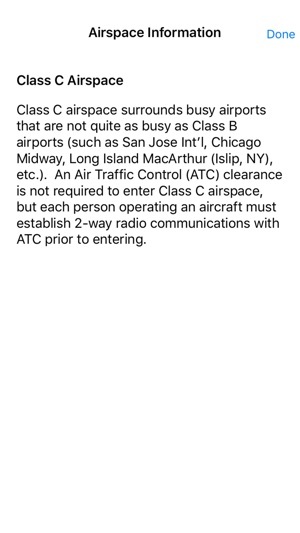 While it isn’t perfect, you can get all the information you need to contact ATC or other organizations to submit a flight plan, and it will also help you plan one out in advance. Be aware that your hardware and connection speed may effect performance. There were 3-4 seconds between when I enabled the GPS access for the app and when the map displayed. Also be aware that it tends to err on the side of caution (which I appreciate when flying...) but it also may not always inform you if you are flying in restricted or off limits air space. 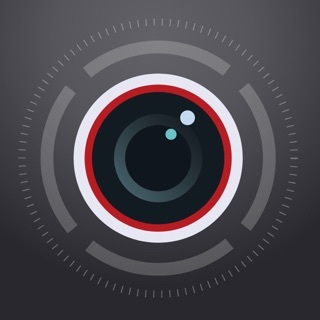 Overall easy to use and a decent UI with some neat graphic elements. I’m glad the FAA put the effort into making this to help drone pilots enjoy the hobby and avoid trouble. 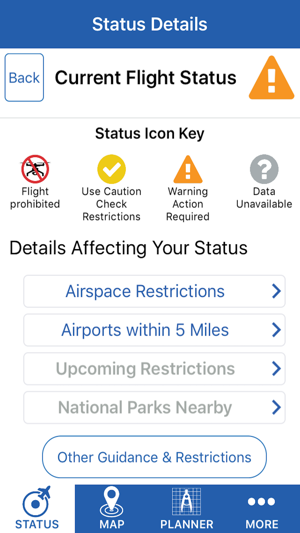 Many drones with smart features will tell you when you’re near an airport or in restricted airspace, but better safe than sorry and between my drones warnings and this app coupled with common sense, I can fly most anywhere and time I feel like and be reasonable certain I am flying legally. As near as I can tell, no part of this app is completely functional and most of the parts that do work just open a website inside the app. It’s full of seemingly random information with no bearing on safe and lawful flying. For example, there’s a list of National Parks but it’s woefully incomplete and what is there links to the public webpage of a given park, but flight restrictions aren’t posted on those pages. Even worse, it seems to pick and choose what it’s going to show you. It’s telling me there’s an airport (private corn field) within 5 miles, but it doesn’t say anything about the restricted airspace above the massive DHS complex between me and that airport. Way too much time has been spent making a desktop icon for the app and not enough time making a functional and useful app. I really, really, really hope this was a big mistake and the wrong version got put on the App Store. This is supposed to be part of the larger UAS safety initiative and if this is any reflection on the rest of the programs we should move into underground shelters. This is really bad guys. Really bad. I tried using this and it is incredible that ANYBODY would EVER suggest it. Open it up, right away tells me what I already know. I’m within 5 mi of an airport, click list of airports....nothing....so already I’m smarter than this app. Exactly what I expected from a govt app. Nearly useless except to tell you that your breaking the law.